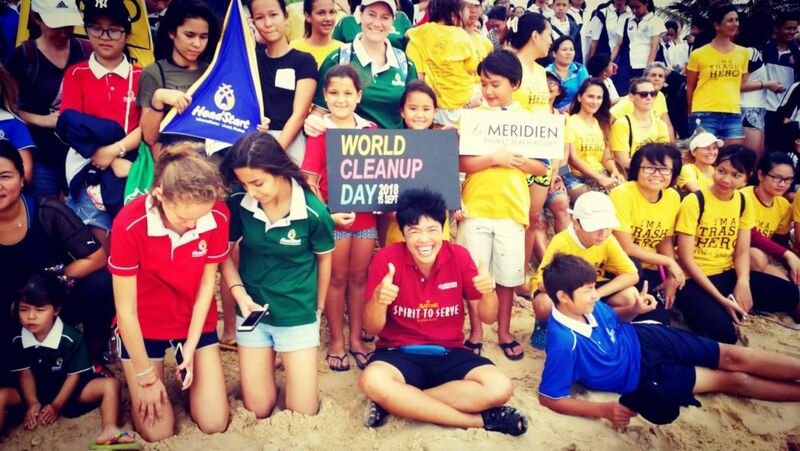 Trash Hero Phuket held their weekly beach cleanup on this year’s World Beach Cleanup Day. Trash Heroes started at 9am at the north end of Karon beach with a group of 220 volunteers. Many individuals and also local resorts in association with the PHA (Phuket Hotels Association), like Le Meridien and Centara Grand Resort, got their staff involved. Lots of smaller local businesses joined together with students and teachers from the HeadStart International School and BIS Phuket. The biggest group of the day came from the Satree School International Program, Phuket town. Within 90 minutes these 220 volunteers picked up an astonishing 770 kilograms of rubbish. Phuket is now, officially, experiencing water shortages, with water in the province’s three catchments just enough for the supply of tap water until May and the condition is expected to get worse if the annual monsoon doesn’t kick in soon. The annual south-west monsoon usually starts dragging in moist air and the ‘wet season’ sometime around Songkran each year. Mr Kraison Mahamad, manager of the Phuket-based provincial waterworks authority (PWA), admits that tap water production would be affected if there is no heavy rain as water in Bang Naeo Dam, Klong Katha and Bang Wad would be enough for use until May at the latest, adding that his office had been told by irrigation officials to limit supply to prolong the supply of tap water to consumers on the tourist island. As a contingency plan to ease water shortage problems, he said his office had contacted several independent suppliers for water supply, but also suggested that consumers should use water sparingly as well. Phuket city mayor, Ms Somjai Suwansuppana, says that the municipal has been providing free water to about 18,000 households each day, with 70% of the water accessed locally and the rest bought in from private suppliers. She said the municipal had contingency plans in place in case there are no rains next month by buying more water from water suppliers to meet consumption needs, adding that there will be sufficient water to meet the need of all the households if they use the water economically. Ms Somjai says, for long-term measures, the municipal administration is mulling water salination projects or recycling of used water (like Singapore) which may not be acceptable now but may be unavoidable in the future if water shortage problems turns critical due to city expansion and increased population. Mr Kongsak Khoopongsakorn, president of Southern Thai Hotels Association, said that hotels are hard hit by the water shortage problem and many of them have resorted to independent suppliers for water supplies to make sure there is water for guests even though the water fee is expensive at between 100-120 baht per cubic metre (The Thaiger has had reports of some people being charged up to 400 baht per cubic metre). He admits that it is beyond the capability of hotels to secure huge raw water sources for water production, adding that the state should step in for help for sustainable tourism growth in the province. Over the past months hundreds of residents had taken to social media complaining that their water supply had been randomly cut off or severely reduced, without notice. Some residents have had no water supply for over a month. The PWA announced odd/even water restrictions on February 2 only to cancel them the following day on the recommendation of the Irrigation Department that there was adequate supplies of water on the island. A female soldier has been attacked and killed by her soldier husband over an alleged sexual affair in Rawai today. The Chalong Police were notified of the incident at 8.30am this morning at a hotel on Patak Road in Rawai. Police arrived at the room to find the 39 year old woman, Ratchadaphon Mongkonrung, a Squadron Leader with the Thai air force. She was unconscious when police arrived and rushed to to Vachira Phuket Hospital where she was pronounced dead upon arrival. A 40 year old man from the air force (Master Sergeant), the husband of the woman, was waiting for police at the scene. He was taken to the Chalong Police Station. Police say they checked with the hotel and found that they had been arguing as Nop-anan thought that his wife was having an affair with another man. He kicked her with his feet before calling for help. The were married and had two children. Nop-anan is facing charges of attacking and killing another person. Phuket’s water lords are now admitting the island’s water situation is in a critical situation – a situation they have had the power to avert but have chosen instead to ‘hope’ for monsoonal rains and go in search of alternative water sources to top up the dwindling catchment resources. Phuket is now in the throws of a water shortage. The PWA says the water supply in Bang Ward Dam is only enough for the end of next month if no rain arrives. The Phuket Water Work Authority manager Kraisorn Mahamat says, “The water in Bang Wad Dam (Kathu) is only enough up to the end of next month if there is no rain, while the other two reservoirs are enough until the rain comes. Meanwhile some residents around the island have randomly had their water supply wither cut off completely or reduced to an useable trickle. Many are being forced to buy water from private water services. The sight of water trucks driving around the island’s roads has become common over the past month. Phuket Irrigation says that authorities will now have to decrease the water supplies for residents to ensure that there is enough water until the end of this dry season. The issue of Phuket’s water management has become a hot topic on social media as residents and business question the management of the island’s water resources. “Hope”. Yes, we checked. He said ‘hope’.